Fast, one-click access to millions of research papers. Integrates with Web of Science, Google Scholar, PubMed and 20,000 other sites. Turbo charge your literature search. One-click access to PDFs. No more VPNs, login forms, redirects, frantic Googling and chasing broken links. Navigate paywalls, Automatically search university library subscriptions, pre-print servers and institutional repositories for PDFs. Work off campus, Take your university library with you wherever you go; at home, at conferences, on the beach. Keep for later, Kopernio automagically files away the PDFs you read in your own private Kopernio Locker. Come back and read them again later, anywhere, anytime. Trusted by over 2,500 research institutions, our free browser plugin seamlessly connects to your existing journal subscriptions. 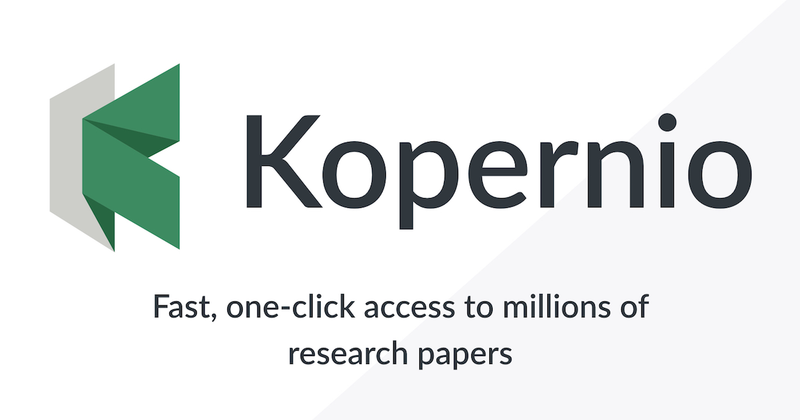 Kopernio travels with you as you conduct research across thousands of websites, including Web of Science, Google Scholar and Pubmed. No more time-consuming navigation through paywalls and site logins – just click once to access the PDFs you need.